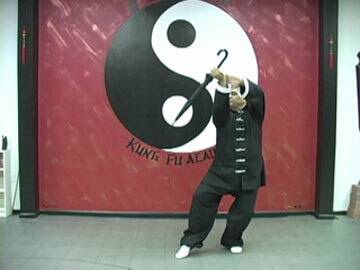 China Hand Kung Fu Academy is dedicated to passing on the ancient art of Weapons. 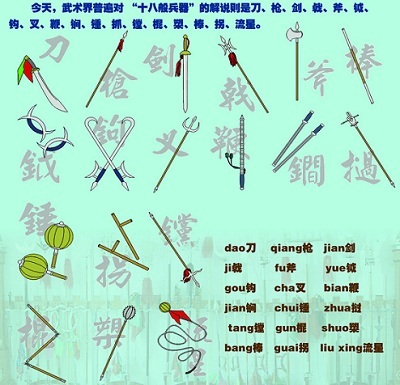 These weapons are taught in the Shaolin Chuan and Tai Chi Chuan Kung Fu Systems. The traditional basic, or classical, Chinese Weapons are the broadsword, double edge sword, long shaft and spear. We instruct the Staff, Broadsword, Double Edge Sword, Spear, Twin Swords, Chain & Throwing Knives. Shaolin Kung Fu weapons, the other Shaolin Kung Fu forms, teach the fundamental use of the weapon and the techniques used in that type of weapons. At the advanced level you learn to use 2 weapons, 1 in each hand. This coordination is advanced and more difficult to master. The Broadsword is a single edged weapon that is considered just to be a knife. Like the butter knife in your kitchen draw which is a single edged knife, this type of sword takes the least amount of skill to use and was taugth to the army or soldiers because it was learned quickly. It uses hacking and slashing techniques. In Chinese it is referred to as the Dao or Tao depending on translation. It has a the general term of "Commander or General Of Weapons." The Double Edge Sword is a 2 (two) edged weapon. This type of sword takes the most amount of skill to use requiring up to 100 times the amount ot practice to become proficient at using. This type of sword was seen used more by people affluence, high rank in the military, and women. It uses subler parrying, deflecting and stabbing techniques. In Chinese it is referred to as the Jian/Gin/Jin depending on translation. It has a the general term of "Gentlemen Of Weapons." From the learning of basic weapons, you can than use any object as a weapon in self-defense. In Chinese it is referred to as the Gun in Chinese. It has the general term of "Grandfather Of Weapons." In Chinese it is referred to as the Chiang in Chinese. It has a the general term of "King Of Weapons." The chain whip is heavy but flexible, allowing it to be literally used as a whip to hit, hook and bind an opponent, restrict his/her movement, and to deflect blows from other weapons. The dart is used for slashing or piercing an opponent. Because the whip is flexible, it can be used to strike around obstacles, including an opponent's block. The whip chain can be folded and hidden from view, making it an easy weapon to carry and conceal. Chain whip uses techniques which many times wrap around the users body to change it's direction and confuse the opponent. Common types of wrapping go around the arms, legs, neck, and torso. As with all flexible weapons the whip chain is hard to control without practice. 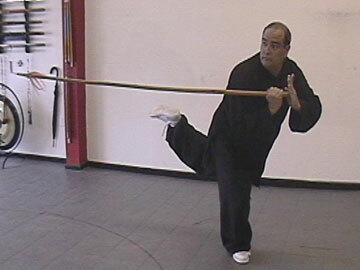 The chain whip is sometimes considered one of the hardest weapons in martial arts to master. In Chinese it is referred to as the Bian in Chinese.